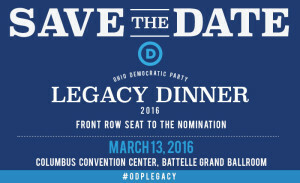 ODP announces Special Guests for 2016 Legacy Dinner – Secretary Hillary Rodham Clinton and Senator Bernie Sanders! Don’t miss this special event! Front row seating to the nomination! COLUMBUS, OH — Today the Ted Strickland for Senate Campaign is releasing a humorous take on Senator Portman’s recent announcement about his position on trade policy: The Portman Triple-Aerial-Flip-Flop.